With all the acronyms and file types (.pdf, .png, .jpeg, .docx) adding another one to the mix can get a bit confusing. We’re here to tell you what a .csv file is, and what it can do to help you and your business. .CSV – a comma-separated values file. AKA Character Separated Values, or Comma Delimited file. 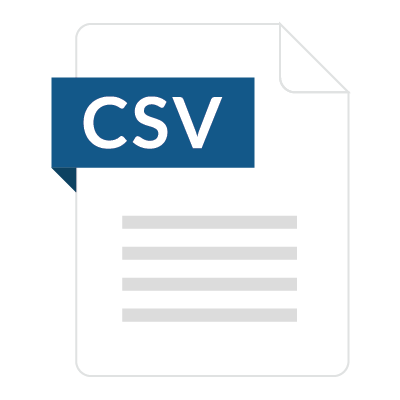 CSV files differ from traditional spreadsheet programs because you only have the ability to have a single sheet without the saved cell, column, or row values. You also can’t save formulas into a CSV file. They can contain numbers and letters only, even though in Microsoft Excel or Google Sheets it looks like a traditional spreadsheet with formulas and calculations. CSV files have two different functions and positives: one would be that they are plain-text files, which makes them easier for a developer to create, and easier for you to import into a spreadsheet or storage database regardless of software. The other function would be to better organize the large amounts of data a company can procure. CSV files are easy to organize and manipulate based on client or company needs. They are primarily used for importing and exporting information to and from the source database. As mentioned before, they’re also easy to convert to traditional spreadsheet files like .xls, .txt, or .html. How to make a CSV file? How can you save as a CSV? Simple, go to the “Save As” tab and select CSV. When trying to open a CSV file, you can do so by going to the ‘Open With’ tab and selecting whichever spreadsheet program you fancy. Free file converters also exist online that can convert CSV files to PDF or RTF files. Typically, databases and contact managers support CSV files. What does a CSV file look like? As you can see, it looks very much like what the file name says, it’s a comma-separated value list. Below is an example of what a table in a spreadsheet would look like for comparison purposes. Again, it’s important to note that when you import a CSV file into a spreadsheet program, it will look like a traditional spreadsheet, separated by columns and cells. However, when you export it back into a CSV file, it will return to a list separated by commas rather than cells. If you’re looking to view a CSV file in a simple text editor rather than a Word document or Google Doc, like on Notepad or using the Sticky Note function on some systems, the process is still simple. You right-click the document, select “edit with” and select whatever text editor. This will open the CSV file in a plain text format like the example shows above. You may find it easier to view and evaluate the data in your CSV file in a spreadsheet format. That’s totally okay because spreadsheets do tend to make things easier to read and comprehend. For Microsoft Excel: you’ll right-click the CSV file and select ‘Open with Excel’. For Google Sheets, you’ll simply upload the file to your cloud, and the content will be displayed in a spreadsheet format. Say you want to export your address book or receipt data. Some applications have specific CSV formats for their systems, like how Google Contacts has a Google CSV, or how Microsoft Outlook similarly has an Outlook CSV. You’ll look for the ‘import’ button and select the CSV file that you wish to import. Why would you use this? Well, if you’re an accountant, law firm, HR office, insurance company, manufacturer, to name a few, you probably use spreadsheets to keep track of all that data. Contact information or budgets, to name two examples, could be managed much easier if you convert the Excel file to a CSV file for transfer purposes. Your information and data will remain safe and secure without fail. eFileCabinet can help you figure out the ins and outs of CSV files, assisting with a safe transfer from person to person, as well as assisting with organization and storage. To find out more, fill out the form below for a free demo.